SNAFU! 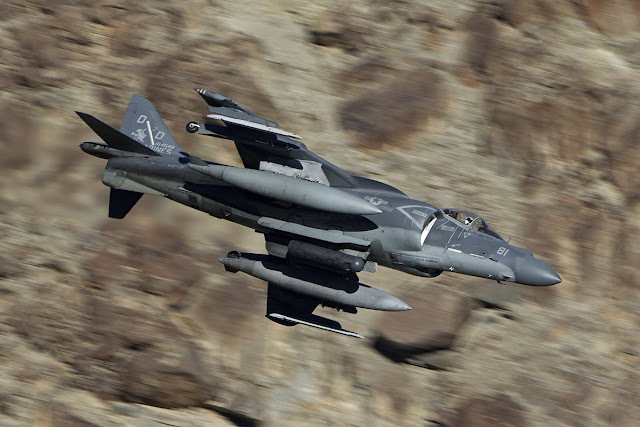 : Has the USMC purposefully "downgraded" the Harrier II for years? Has the USMC purposefully "downgraded" the Harrier II for years? The Marine Corps in its aviation plan lays out an ambitious suite of upgrades for the AV-8B. New software slated for 2020 will allow the Harrier to fire Advanced Precision-Kill Weapon System laser-guided rockets and GPS-guided Joint Stand-Off Weapon glide bombs. In 2021 the Harriers will get AIM-9X and AIM-120C air-to-air missiles, the LITENING Gen 4 targeting pod and the Link 16 radio datalink. The Corps in 2023 plans to give Harrier pilots a helmet-mounted sight. The jump jets the same year will get a new satellite-communications system. The Marines expect the old jump jets to remain highly capable in their last few years of service. "The Harrier has been and continues to be the premier [tactical air] platform aboard the MEU." Harriers will finally be getting a long range missile, Aim-9X, advanced targeting pod, SATCOM and Link16? This isn't cutting edge stuff. This is stuff that's been around for awhile now. Remember how I've been saying that the F-35B is the only model that's a clear win over the legacy model? With these upgrades the cost vs capability arguments comes to the forefront and its not so clear cut that the F-35B is worth the price compared to an upgraded Harrier. Additionally I keep seeing the USMC buy over capacity for the requirement. We have 120 odd Harriers and a couple hundred Hornets but we're buying 420 F-35Bs? Well remember that its been stated that the Prowler mission is going away. That a future electronic attack version of the F-35 is suppose to fill this mission. An additional worry is that the USMC is buying so many of them early that replacements of these replacements (for the Hornets) is almost guaranteed. The Aviation Plan has unfortunately been a muddled mess. The vacillation between planning for the Harrier to remain in service till 2030, then switching to keeping the Hornet in service and now walking a line between keeping both planes till then while buying the F-35B is tying up funds better spent elsewhere. We need clarity and fiscal responsibility. What we don't need is starvation of the operating force to fund procurement. If the Harrier is here now and can be brought up to speed then that's exactly what we need to do.